At the concert 'Blues for Jimi' you can see the Ibanez CS-9 on the front of his pedal board, together with the MXR GT-OD. A list of John Taylor's gear compiled in 2003 by his guitar technician and another one taken by his old website trusttheprocess.com. Duff put this photo on his Facebook page, it shows the CS-9 on the upper right. At 26:50 in this Rig Rundown for Kim Thayil of [Sound Garden](http://equipboard.com/band/soundgarden), his gear is displayed, showing his Ibanez cs9. At 6:50 in the video Ben shows his pedalboard with the Ibanez CS-9 Chorus which he uses while touring with Incubus . According to Premier Guitar's rig rundown, Vile uses the Ibanez CS9 pedal. At around 19:55 in this Rig Rundown video, you can see the Stereo Chorus sitting on the top left of Jesse's pedalboard. He does not use it for the Chorus sound, instead he uses it to split the bass signal between his two amps (Peavey Festival 800 and Acoustic 450B) He says he discovered it "by accident" because he did not have a 1/4 inch splitter. He says he "noticed the stereo part of the pedal" and seeing as he "hadn't used both outputs before" he used them to split the signal to both his amps. In the [accompanying article](http://www.premierguitar.com/articles/21712-rig-rundown-death-from-above-1979) from *Premier Guitar*, they write: "Keeler’s aggressive, distorted bass tone comes mostly from his amps. His pedals are relatively straightforward, and he uses them sparingly. The signal chain starts with a Dunlop Wah, then into an [MXR M80 Bass D.I.+](http://equipboard.com/items/mxr-m80-bass-di), which sends a bass signal to the FOH engineer. From there, the signal goes to an [MXR Ten-Band EQ](http://equipboard.com/items/mxr-m-108-ten-band-graphic-equalizer-pedal), an [MXR Carbon Copy Analog Delay](http://equipboard.com/items/mxr-m169-carbon-copy-analog-delay-guitar-effects-pedal), [Morley A/B switcher](http://equipboard.com/items/morley-aby-footswitch), then off to the Ibanez CS9 Stereo Chorus, which splits the signal between his two amps. Before hitting the amps, one signal is run through an [Electro-Harmonix Micro POG](http://equipboard.com/items/electro-harmonix-micro-pog). The last stop in the signal chain is a [Dunlop Kerry King KFK Q Zone](http://equipboard.com/items/mxr-cry-baby-kfk-q-zone)." Sco uses this chorus pedal as stated in this article. 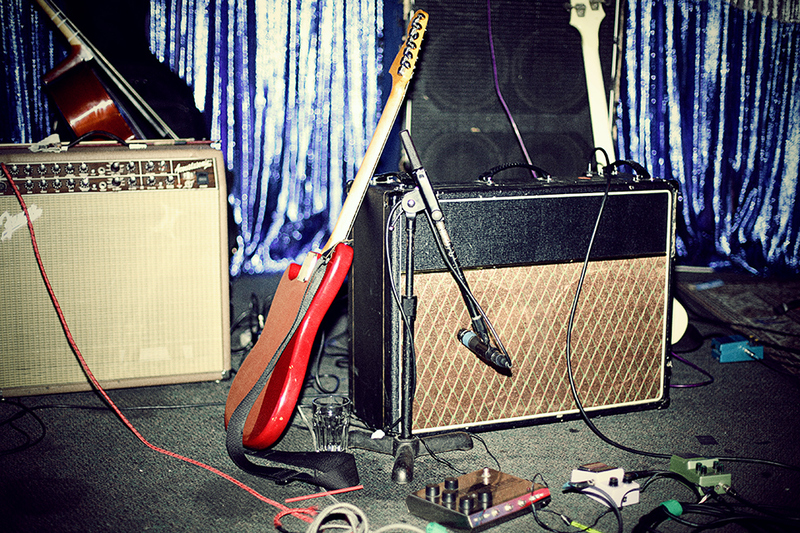 In this photo, which partially shows Main's pedalboard, the Ibanez CS9 Stereo Chorus is visible. In this photo [(source)](http://www.kulick.net/blog/index.shtml#day24), the Ibanez CS-9 chorus pedal can be seen. This [article](http://bluesonline.weebly.com/ruben-block.html) says, Ruben used a Ibanez CS-9. Chorus seen on Hindman's board. Picture of the pedal board taken at the Chastity Belt show at the ACU Utrecht, The Netherlands the 23rd of September 2017.
another pedal I prefer to the CE2... sounds the same, has rudimentary stereo. I wish I had kept this pedal but I was really down on the bypass sound at the time and I had this idea that I needed a d-time control on a chorus back then. I dunno. The reissues of these sounds great too as does the mini version. I think it's the John Squire/Stone Roses chorus sound from the first album. My mate had one in the first band I was ever in and it sounded really nice. I think you're right... the rcuit is really similar to a CE2 though, I banez just kinda tweaked it sorta like they massaged the OD1 into the TS88. anyway, having owned a zillion analog choruses, this was a real keeper, although the the D-time control on the FL9 flanger can get out to 30 seconds so the FL9 is pretty much the same pedal with variable delay time and feedback... I had one of those quite recently and for some reason I took it in my head to sell that too, I must have been thinking I preferred my electric mistress. I dunno.